A tense encounter is in store this weekend as the coveted Westmeath Ladies Senior Club Championship title is up for grabs in St Lomans grounds this weekend. A 5pm throw in time in Lakepoint Park, Mullingar compliments the fixtures on the mens side of the intermediate club championship which means supporters and fans of both games are in for a treat this Saturday the 6th October. Miltown ladies will seek to return the championship title to the north after a two year spell since their highly successful 2015 season where they won a third county championship in a row and followed that up with more glory, achieving Leinster and All-Ireland Titles in the Ladies Club Championship. This success opened eyes nationally to the standard of ladies club football in our county and this 2015 Miltown Ladies team will go down in history. It hasn’t been as long since Miltown ladies won some silverware, however, as in early August of this year they had a convincing 4-17 to 0-04 win over Mullingar Shamrocks to win the Division 1 League title. 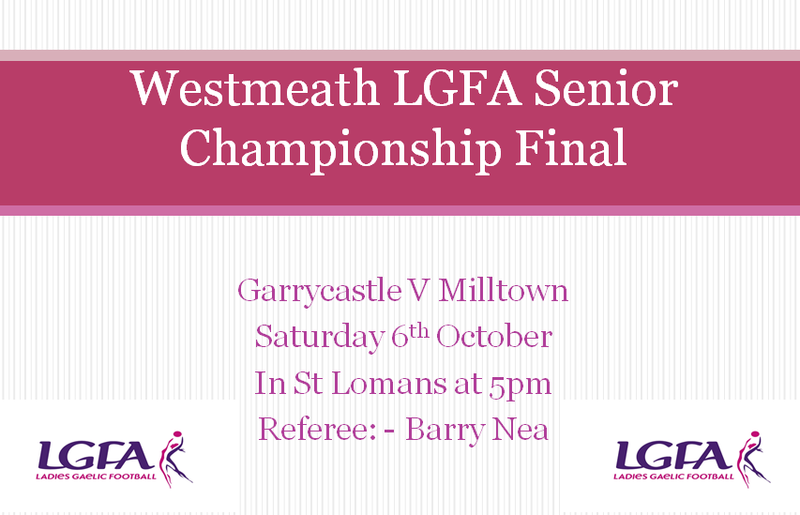 Garrycastle ladies will be looking to end a 6 year wait since their last championship title in the county. 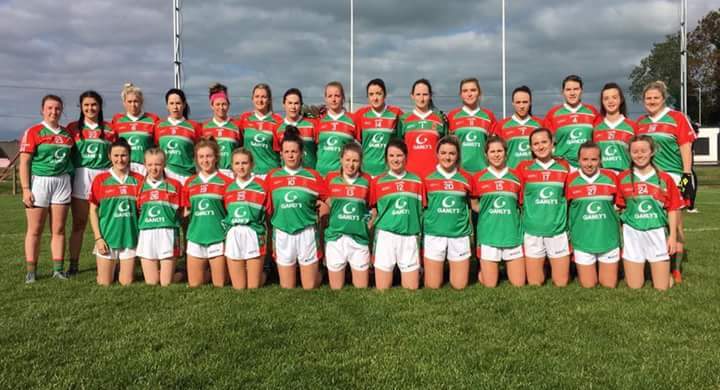 The ladies team, as well as their male counterparts, have been highly decorated in the last decade, however they will be seeking their first Club Championship win since 2012 in Saturday’s decider. Noteably, it was more recent than this that Garrycastle ladies contested a senior county final. In 2016 they were the losing side to St Lomans and the memory of this defeat is certainly a driving force Garrycastle will carry with them into this weekend. The most recent occasion we saw these two teams was earlier this year, in the group stages of the championship the two sides met in a tasty battle that flared up old rivalries, Miltown edged out winners in their home grounds on this occasion on a scoreline of 1-9 to 1-6 over Garrycastle. Both teams will have been thankful of the new structure of club championship that meant they met previously this year as they will try and learn from this encounter and bring all lessons into this weekends battle. There certainly is history between the two teams and they have contested many county finals between them in the not so distant past. However, there will be a sense of unfamiliarity in both teams, as not everyone in both panels can relate to this rivalry. In what is becoming trojan development, typical in Westmeath ladies club football, both sides have highly developed and changed panels with a mix of young and experienced, as well as honed styles of play that will make this clash familiar in one sense, but in another, evolved and incomparable. 2017’s reigning champions St Lomans will play host to the final encounter between Miltown and Garrycastle this Saturday the 6th Oct at 5pm. Confidence is in referee Barry Nea to facilitate and manage this game as both teams are testament to the narrowing gap between ladies and mens football with the style of play, skill and physicality they bring to the table. Major challenges lie in store for both teams to try overcome the other this weekend to cross the final hurdle and for anyone attending this fixture – it shows all the hallmarks of an epic encounter! Westmeath GAA would like to wish all the best to everyone involved and encourage as much support as possible.